Way To Go! LA Fire Companies In East Hollywood Knocked down the dumpster fire before it burned the entire building. 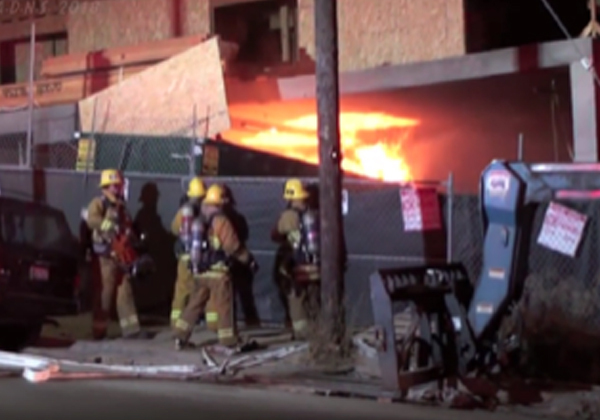 The fire involved the bottom level of a three story building under construction at the intersection of Melrose and Virgil Avenues in East Hollywood. A quick response and actions by Los Angeles Firefighters and a concrete level as a partition-protection prevented the fire from consuming the three story structure still in the framing stage. There were no injuries, the fire was snuffed out in approximately 15 minutes. The cause of the late night blaze is under investigation. This is the 4th wood framed construction fire in 4 weeks as over 25 large wood framed projects have been attacked by fire in the last 18 months. Insurance Underwriters are now looking for more than just a fence and security guards they want more fire protection and M-Fire is now providing Best Practice for Wood Framed Buildings all around the USA. Our Mighty Fire Breaker™ Class-A fire protection process involves spraying a clean fire inhibitor on 100% of the lumber as these projects are framed vertically. M-Fire’s patent-pending APP is about to launch giving Fire Chiefs more information about buildings that are fire protected so they have more information when making the decision to save the buildings or just defend neighboring buildings.